The ’11-’12 Phoenix Coyotes have represented the now Arizona Coyotes franchise in both Ultimate NHL Playoffs, and were eliminated in the First Round both times. RW – Shane Doan – One of the last remaining original Winnipeg Jets, Doan has served as captain of this franchise for a very long time. Over 18 seasons, he has posted 361 goals, 520 assists and 881 points, which are all franchise records, by far. C – Keith Tkachuk – Tkachuk was the franchises first captain. He was a point-per-game player for the Yotes as he posted 334 points in 332 games played. He spent five seasons with the team, but the last four was injury-ridden as he never played more than 70 games in a season. D – Teppo Numminen – In the early days of the franchise, Numminen was the team’s best defenseman. In seven seasons as a Coyote, Numminen appeared in 551 games, which is third-most in franchise history. The ’97-’98 season was his best as he posted 11 goals, 40 assists and 51 points in 82 games played and was a +25. 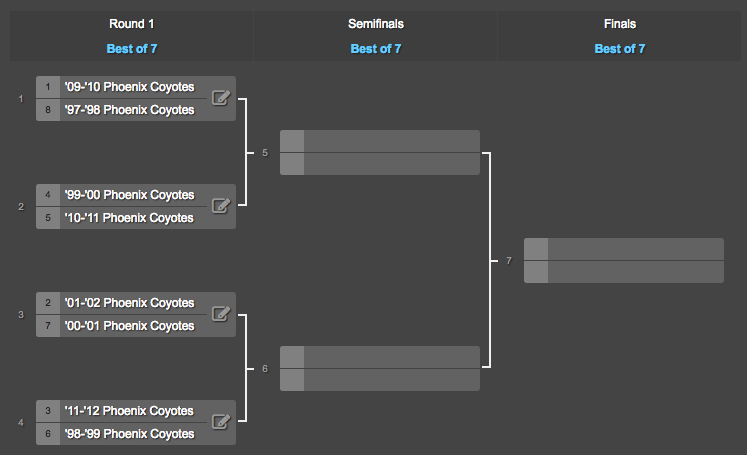 This entry was posted in Qualifying Tournament, Ultimate NHL Playoff and tagged Arizona Coyotes, Keith Tkachuk, Phoenix Coyotes, Qualifying Tournament, Shane Doan, Teppu Numminen, Ultimate NHL Playoff. Bookmark the permalink.